Certainly no expert,but I believe that the Dunklegelb,that appeared late in the war was different from early war Dunklegelb.I mean Mig Ammo offers a late war set,and it does look more buff.Throw your question on the forum where others will see,I'm sure the experts will chime in,immediately sure I even remember an old topic about Dunlegelb. As much as I like a healthy debate, I kept it here because I believe there it's no wrong answer as long as you try to get close. With various suppliers supplying various lots and various methods of thinning and application along with various external situations (bombing, etc. ), none of us can be totally certain so it's easier just to be happy in the build. And use your imagination if you feel like it. 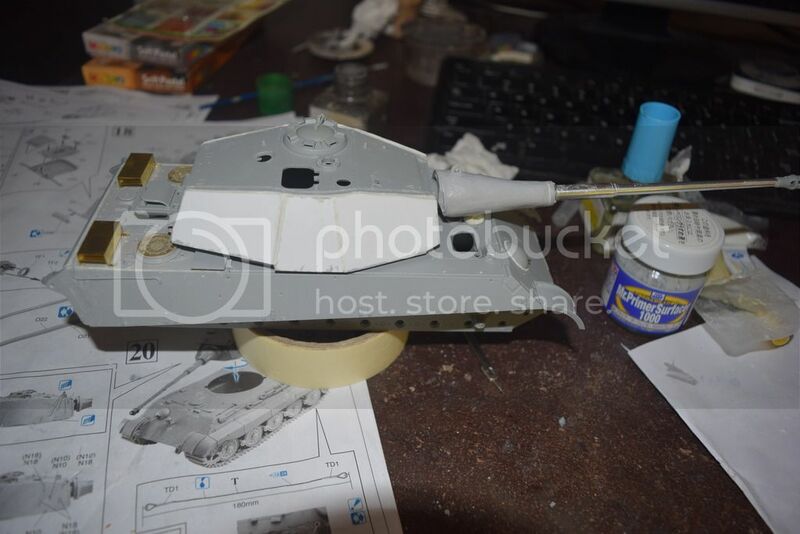 I have a Dragon Pz III that I plan to make as A DAK vehicle with it's original Pz grey over painted in Italian sand, suggesting some horse trading between the two allies. Thank you for the photo. Some look almost green. I used two methods for the camo. Rotbrun was freehand and Dunkelgrun was with Panzer Putty. Now she's got a coat of Future on her and she'll cure for a couple of days. I haven't done much with the Schurzen, yet. I won't be using all of them, but want to make sure I have paint where I need it. The Tiger striped Panzers with the Porsche turret you see are the tanks from 3rd Kompagnie SpzAbt. 503. The 1st Kompagnie used a more blobular approach with more panzer yellow showing through. I'll have to custom make the number decals. Mine will be Panzer 112. Decals on. Ochre wash and tracks, too. Now I can decide how much or how few Schurzen I'll use. I wish Friuls didn't cost as much as a new kit. They just feel so much more satisfactory in your hands then rubber band tracks. Hey Gary! It's looking really nice! I like the camo a lot. Tamiya has plastic indy link tracks (35165) for the King Tiger and they are relatively affordable at around $10 - $20 range. no comparison to fruils but way easier on the wallet. 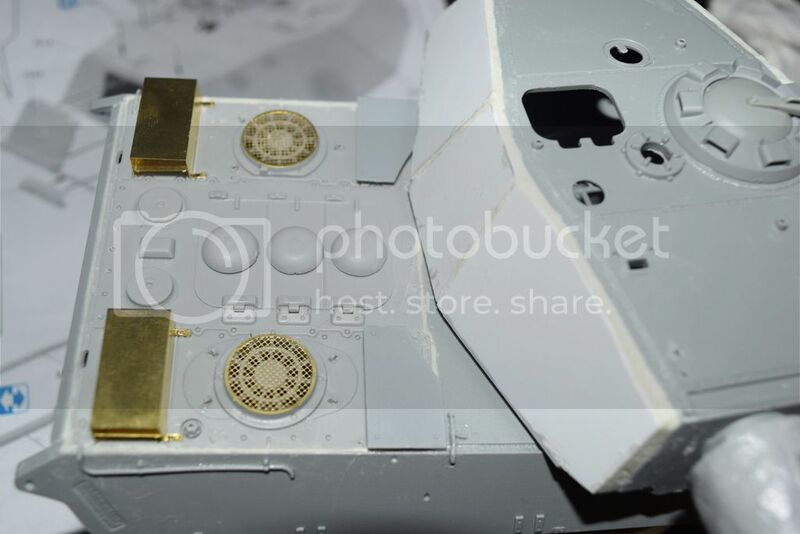 HobbyBoss also has King Tiger plastic indy tracks but they are for a late type henschel tiger with 18-tooth sprockets. Nice work on the camo,mines moving along,pics soon. Thanks for the heads up on the tracks. I haven't built a tank with indy plastic links, yet. I have two in the stash with magic tracks. I'm really still finding my way with armor. Especially when it comes to detailing the undercarriage. Looks like I'm first across the line. Not that it was a race. Because I usually build aircraft, I'm used to spending a ton of time with fillers and abrasives. It was nice not to have to go through that on this model. Anyway...here are my photos! 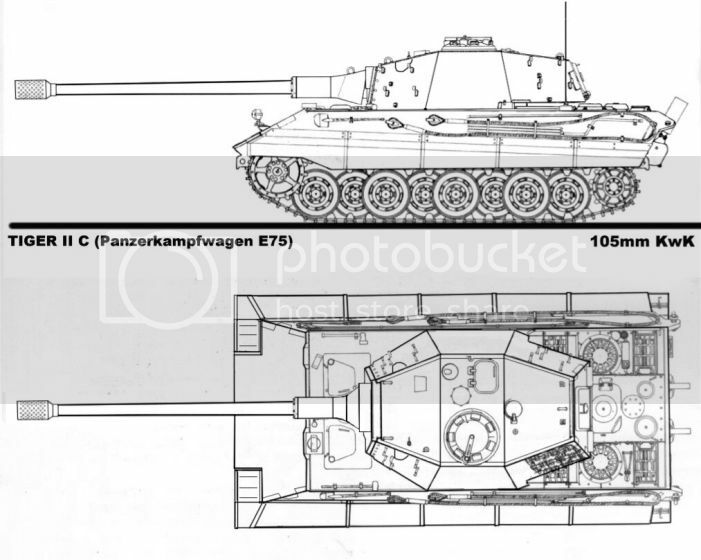 Oh, BTW I tried to upload to the Big Cats Mk IV Gallery but couldn't find it. Can someone point me in the correct direction, please. I took photos last night on the vaunted blue background, but didn't like them. Please excuse signs of my domestic life in the photos. If I was a whiz bang at photoshop, I'd make an effort at putting in some kind of historical background. But I'm not. On the Glacis, you can see two shell hits highlighted by sun and shadow. Other, lighter, hits show red primer revealed beneath chipped Zimmerit. This was the first time I did a dot filter with oils. I think it helped the look of the model greatly. Unfortunately I did it before the pin wash, so my pin wash pooled in places while leaving others vacant. This was a nice simple kit to learn on. Don't tell anyone that someone forgot to load the tow shackles that are sitting back at the depot. Historical photos show Tiger 112 didn't have her schurzen on before or after her demise. I used a wet palette and acrylics to do the pioneer tools. this allowed me to give subtle variations between each tool and the cleaning rods. I haven't mastered painting the cables yet. When I was in the Marines on the M-109A3, our towing cable had been coated with oil which turned black over time. To clean it, we'd hit it with the wire brush and any surface rust and dirt came off easily leaving shiny steel ready for inspection. If you ever build the Academy Tiger I late, you'll find that it comes with 2 decals for the fire extinguisher. I didn't want to use the spare for this build. I learned a lot on this build, and enjoyed sharing with you all. I'll be coming back to see what you guys get up to with your big cats. Thank you Dustin for firing up and hosting the campaign! I'm glad you joined this campaign sir. I didn't see the gallery either. I'll figure that out. Wow Gaz,that was fast and good.Very nice.Th Dunkelgelb shade came out good also. Nice job, love the zim texture. I personally adore homemade zim because it just feels more natural what with more randomness between the lines. Some aftermarket zim sets look too uniform for my taste. I'll also be starting my run pretty soon. Just about to clear my schedules and getting ready to get stuck in. Gaz, looks cool -- congrats! Thank you for your kind words! I really appreciate hearing from you. The shell hits were easy. I heated the tip of an old dull screw and it looked as good as anything I'd seen in historical photos. Bazooka type rounds make a different hole. Thanks for hooking up the gallery. Photos uploaded! The dot filter really added a touch of yellow that was lacking. I still like the honey Dunkelgelb. Maybe in Big Cats V I'll do a Panther with a solid scheme. Now that I've done it twice, I don't think I'll ever buy zimmerit. I feel better, having done that bit myself. Twenty years ago, I was defeated by a lack of a suitable putty... but now I think I'm up to the trickiest pattern. It helps that being inexact makes it somehow more realistic. 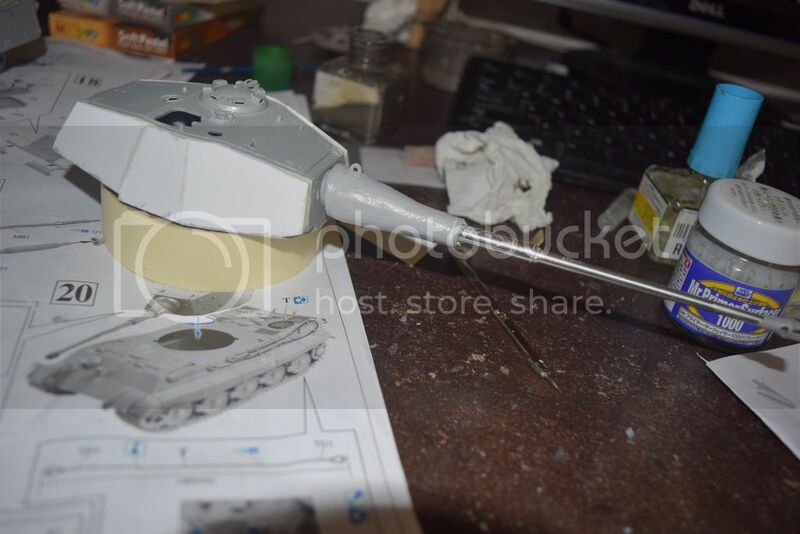 I'm probably in with a 1/35 Zvezda Panther ausf. D. I was going to build it for the 500+ Campaign but things got a bit side-tracked here with some family stuff. I posted a starter picture in the 500+ thread but never started any construction. I'll make a new starter picture with something dated. I'll get started after I get a few other things caught up. Started by swapping out the engine deck on the KT with the one from the E-50. 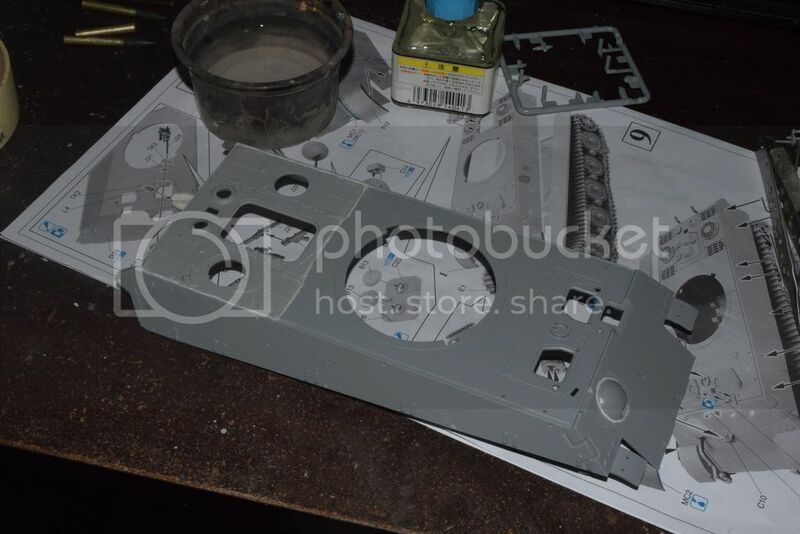 Lots of sawing, cutting and putty involved - messy stuff. I accidentally scratched that when my knife slipped while cutting. Hopefully Mr.Surfacer will come to the rescue. Well that's all for now. Glad to see you getting started! Superglue is great for those little errors. As soon as. It dries, sand away the excess. If it dries overnight it is much harder to sand. It won't shrink like Mr. Surfacer, and you won't have to wait long to get back to building. New updates. Started working on the turret. Wanted to base my design of this picture I happened to chance upon on the net. 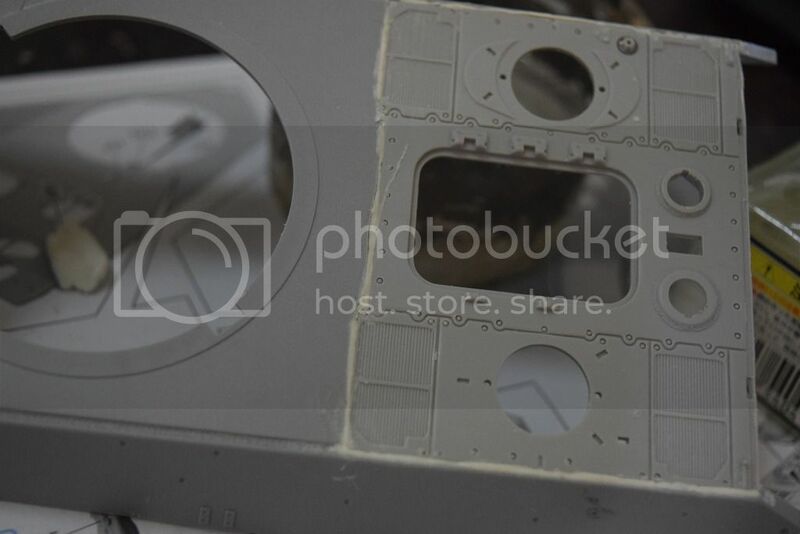 The new turret features angular slightly sloped welded plates of Styrene! Also I sculpted a new mantlet which extends the length of the gun by about 2cm - a more reasonable length for a what-if upgrade to the 88mm gun than the ridiculous L/100 barrel which I had planned to use. The new length of the gun is around 20cm which makes it an L/79 or L/80 if rounded out.